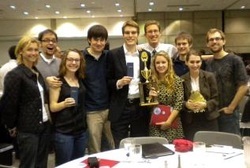 For the first time in its three years of competition, the UW mock trial team competed at the National Championship Tournament in Des Moines, Iowa. After four scintillating rounds - two of which were against former national champions - the UW students finished with an Honorable Mention. The team’s only loss came against the defending national champion and this year’s runner-up, New York University. Keena Bean, Landon Whitbread and Nick Crown were recognized for their performances during the weekend, earning All-American status. The UW’s three All-American awards were more than any other team in the field of 48. The team’s success capped the UW program’s most exciting season to date. Better yet, the program does not lose any members to graduation. We’re already looking forward to next year!